Planning a case starts with careful attention to a patient’s desired outcome. Sometimes there are just one or two teeth that really bother you. Do we then need to treat all teeth to create a harmonious smile? Any dental work, no matter how carefully done or how high the quality the material, could require future replacement over your lifetime. While many of my cases involve 6 or more teeth or even the entire mouth, whenever possible, conservative treatment options are indicated. 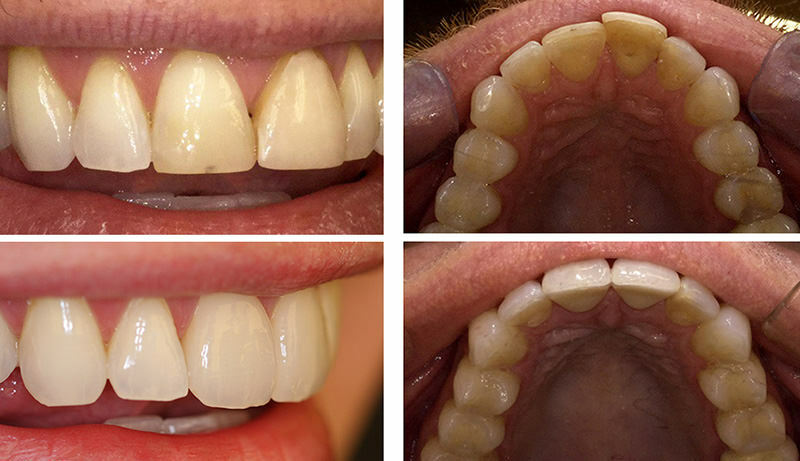 Here are three recent cases where we applied conservative treatments to create a smile makeover. All of these three cases shared a similar starting point: two central front teeth sticking out with unsightly “black triangle” spaces between teeth. If these teeth were perfect in form, the best treatment would be to simply move them into an ideal alignment with Invisalign. However, these original teeth had been compromised with past damage and now with worn-out restorations. In these three cases, changing their position was achieved by placing two individual porcelain crowns. Adjacent teeth were whitened with Zoom! 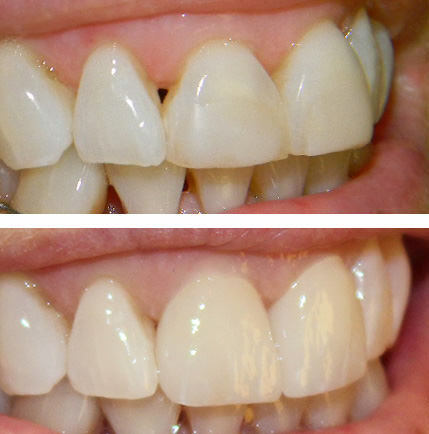 In-office whitening and surface enamel irregularities were recontoured using light sanding disks. Crowns may be indicated–rather than veneers–when we need to significantly change the position of the teeth, block out a darkened tooth, or when the original teeth show certain wear patterns. I will present veneer cases in a future post. 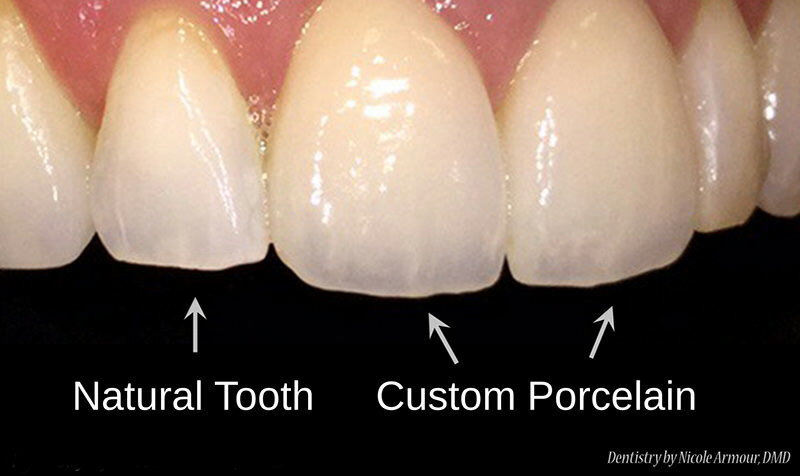 When creating a porcelain (metal-free) restoration for only one or two front teeth, matching the adjacent teeth is critical. This is more involved than simply matching a shade/color. Photographing the teeth before treatment with a black contraster placed behind the natural teeth will best show my lab technician how much light shines through (translucency) and presence of any pigment, crack lines, textures, or any other unique characteristics to be artistically replicated. 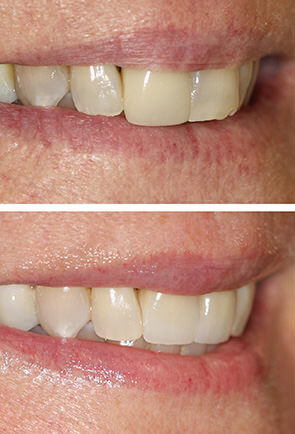 The final result is a seamless transition between restored and natural teeth. A case like these takes about 1 month to complete. Each treatment plan is individualized to best meet your specific needs. 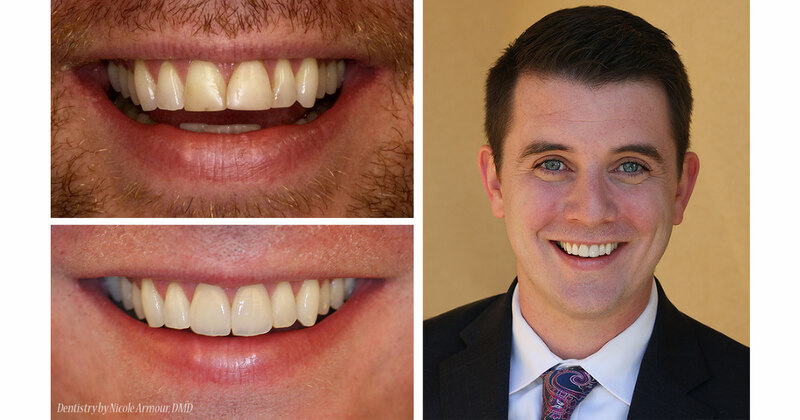 View our smile gallery for more examples of what high-quality cosmetic dentistry can do for you. If you wish to review your treatment options, contact us at Armour Dentistry for a consultation appointment!